Upside Down Tomato Tart - What the Forks for Dinner? Even though summer is over, somethings still hang on. 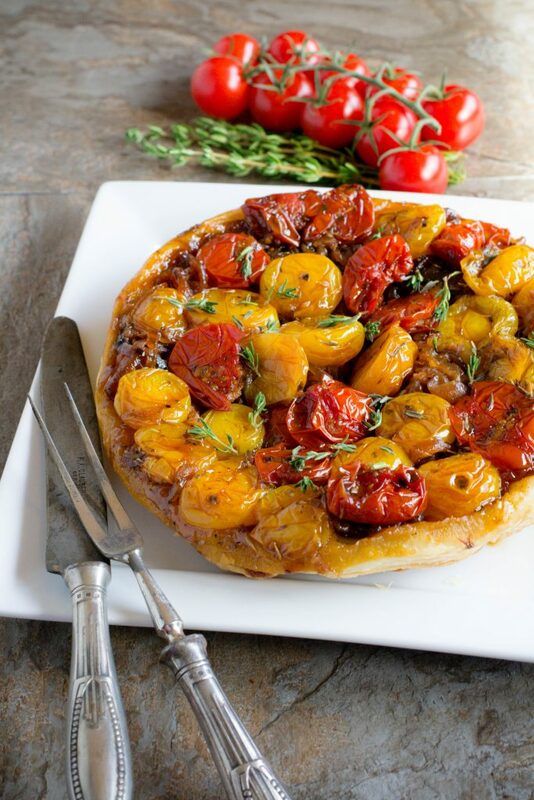 Cherry Tomatoes to name one , Upside Down Tomato Tart can use up those hanger-oner’s. Although I have not had a garden in several years, there were times when I still had tomatoes the end of October. Especially cherry tomatoes, they just keep going and going!! But, good things come in small packages, whether ruby red, sunny yellow, or one of the heirloom varieties, cherry tomatoes are bite size bursts of sweetness. Roasting tomatoes intensifies their flavor, adding sugar and balsamic vinegar gives cherry or any other tomato a caramelized tang. Add to the flavor palette garlic, parsley, and thyme….ubber flavor! Everything in this dish is about intensifying flavor. Red onions, slowly cooked in, nothing but butter and a pinch of sugar until they are dark and glossy, are the next flavor layer. I was leaning towards a bruschetta, but I wanted to highlight the tomatoes…I had red and yellow ( thank you Sandy for the yellow). Now this is a bit of a stretch of a story, but……Tim and I were talking about French Apple Cake, it being apple season and the cake being one of our most popular recipes on Pinterest, French Apple Cake is kinda like pineapple upside down cake……only with apples. Why not with cherry tomatoes? 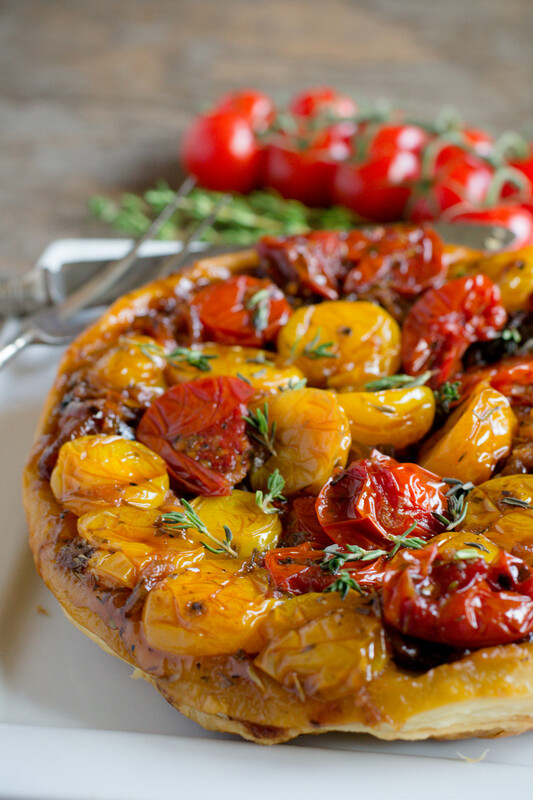 Arrange the tomatoes in a pan, better yet, a cast iron skillet, and cover them with those beautiful onions. But what for the cake part? Of course not cake, maybe a biscuit, or cornbread…..no, the only answer was puff pastry. Light and flaky, perfectly golden, and buttery. So, here’s what I did….. I slow roasted the tomatoes in caramelized sugar and white balsamic vinegar for about an hour. Arranged them in a small cast iron skillet, removing them from the their cooking juice. Topped them with the caramelized onions and cut a circle of puff pastry to the size of the skillet. Into the oven for about 20 minutes, the puff pastry is so beautiful when it cooks. all puffy and golden brown. Once out of the oven. allow to cool for five minutes or so, invert onto a serving plate…….its a sight to behold. 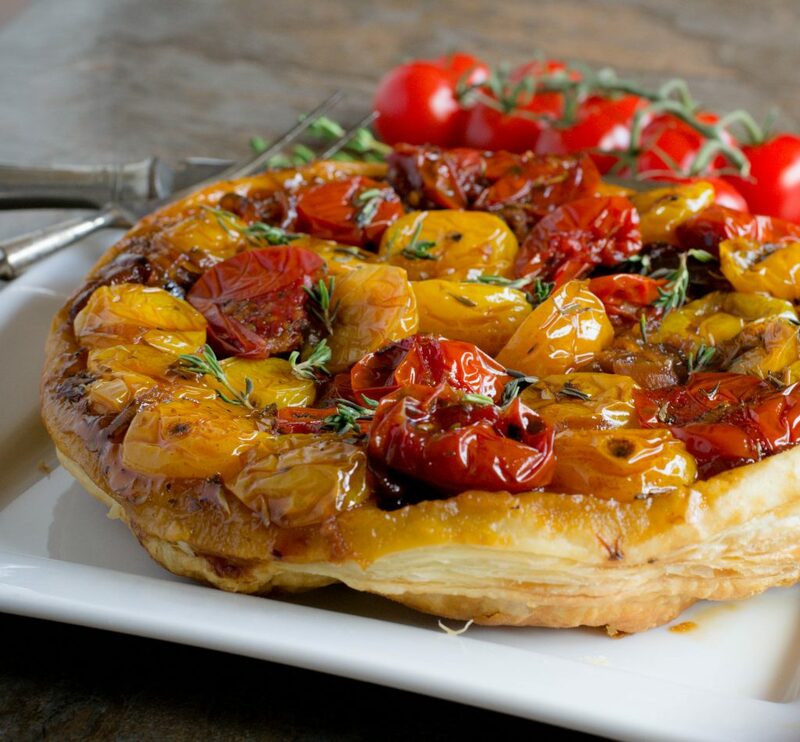 Beautiful golden pastry topped with onions, and the beautiful colors of the cherry tomatoes. How did it taste you ask ???? Words escape me…..yeah it was that good!! Looking to use up the end of your cherry tomato bounty and have a impressive presentation? 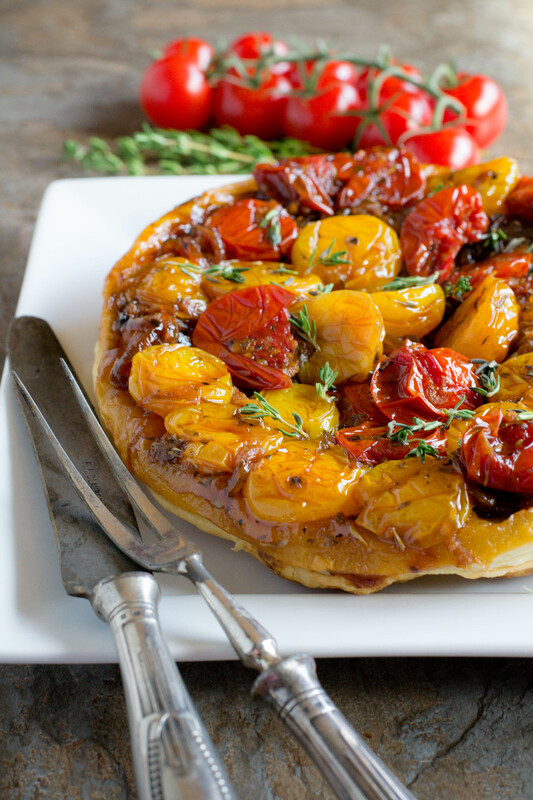 Try Upside Down Tomato Tart! Caramelize sugar in a cast iron skillet over medium heat. Once caramelized, deglaze with white balsamic vinegar. Stir until well combined adding garlic, herbs, and olive oil. Place cherry tomato into the sauce, and bake in the 275° F oven for about 1 hour,or until skins are wrinkly. Remove from oven and set aside. Melt 3 tablespoons butter in a large skillet.Add onions, a large pinch of sugar. Grease a cast iron skillet with the remaining tablespoon of butter. 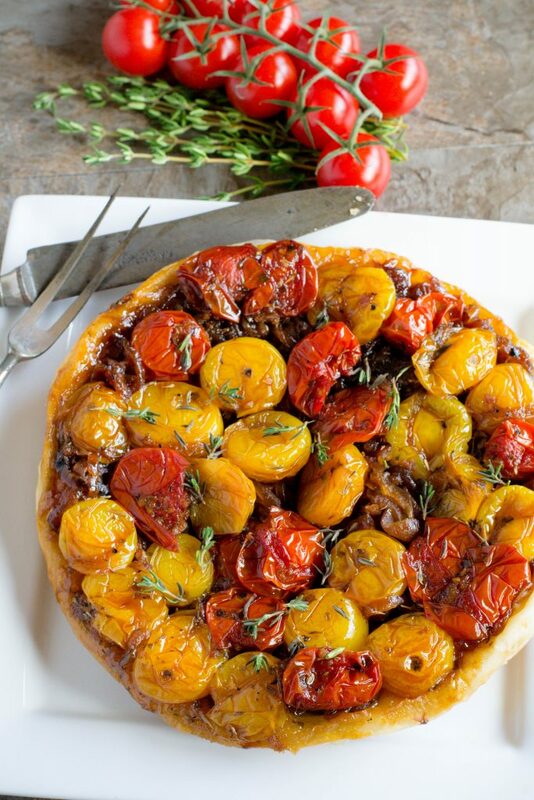 Top with cooked tomatoes, using a slotted a slotted spoon to remove from their cooking liquid. 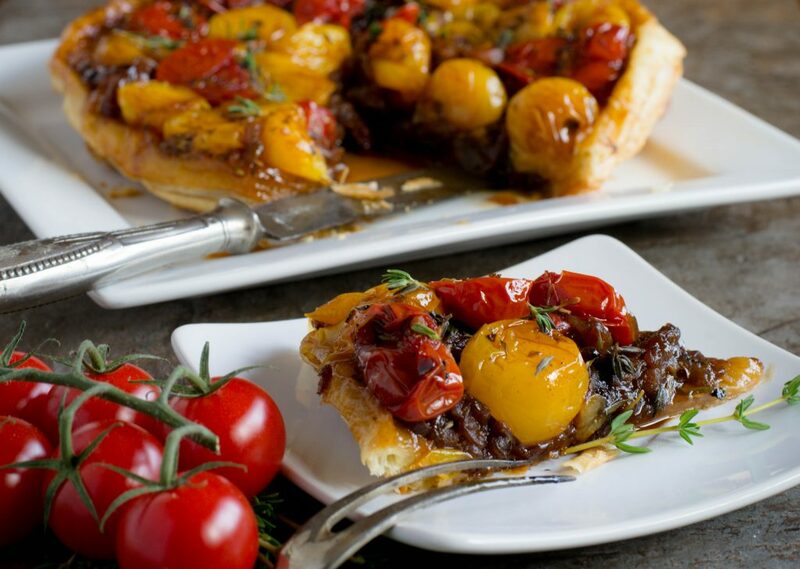 Top tomatoes with caramelized onions. Cut puff pastry in a circle to fit the cast iron skillet and place over onions. Cut several slits to vent. Bake in 425° F oven for 20 to 25 minutes, until golden. Cool in pan for 5 minutes. Place a plate on top of the pan and carefully invert, then remove skillet. I used a small cast iron skillet.